This is the longest recording by far of the first version of Bruckner’s Third Symphony. There are longish breaks between movements in this live performance and they somewhat exaggerate its duration and its real extent is more like just under 87 minutes, allowing for decent pauses. Nevertheless, it is still the most leisurely by far - except “leisurely” is hardly the word to describe so spacious, unhurried and grand an interpretation. The next slowest is Georg Tintner’s recording of 78 minutes, which cannot boast as fine an orchestra or indeed so gripping an interpretation. For purposes of comparison, I re-listened to recordings by Inbal and Blomstedt, who take just under seventy minutes. There's also the more eccentric reconstruction by Peter Jan Marthé, recorded live in the same venue in 2005 using an edition combining elements from all three published scores and substituting the 1876 Adagio. That interpretation by Marthé is in many ways closest to the recording under review here. I am one of those who, I fear, cannot countenance Sir Roger Norrington’s unseemly brisk 57 minutes. According to the excellent notes by Executive Producer Professor Klaus Laczika, the justification for the tempi here is based upon an extrapolation from Bruckner’s comments in letters to Hans Richter concerning the Eighth Symphony. There he laments that conductors invariably played it too fast. Certainly the steady pulse and carefully scaled crescendo which mark the first five and a half minutes signal that we are about to hear an interpretation of real status and profundity. Nowadays there is an increasing acceptance of the merits and legitimacy of the 1873 score. We may also now hear the Carragan edition of the symphony as it had developed in 1874, in the live recording by Gerd Schaller, derived from the copy Bruckner kept and progressively tinkered with. 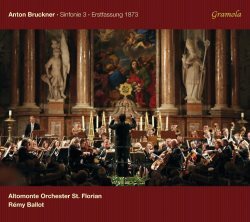 Certainly the power and serenity of this new recording, made in the Stiftsbasilika at St. Florian, provide the best possible advocacy of the virtues of Bruckner’s earliest thoughts. It is arguable that, despite its poor reception, the Third Symphony had significance to Bruckner’s personal development as a composer and to the symphonic music of his era similar to that of the Eroica to Beethoven in his. It represents a decisive break with what had come before. It establishes recognisable Brucknerian tropes, such as the reappearance of a central thema, the cyclical structure, the repetitions suggestive of litany, the granitic blocks of sound imitating the sonorities of the organ and the progress towards apotheosis; all those elements present here are to become fixtures in his subsequent œuvre. Only the Finale remains slightly unsatisfactory and disjointed; otherwise we are hearing what is recognisably the mature Bruckner. For some listeners, the very broad and reverberant acoustic of the basilica might be problematic, but it serves to accommodate and underline the grandeur of this performance and rarely results in any “harmonic mush”. Only in passages such as the descending semiquavers at the start of the Finale and the demisemiquavers in the second theme of the first movement is there some blurring of the articulation. Otherwise, the hypnotic intensity and solemn sententiousness of the music is grandly served by the reverberation. The effect was perhaps even more impressive live than it is now on disc. Blomstedt’s live recording has a better orchestra and sounds marginally clearer than the Inbal but Ballot’s orchestra is equal to the Gewandhausorchester Leipzig and he finds more transcendence in the music than either Blomstedt or Inbal, an effect enhanced by the sonority of the venue. Ballot adopts a far steadier, more ominous pulse at the start of the first movement than competitive recordings and maintains a tempo which is truly “misterioso”. The horn blip at 2:36 is mildly unfortunate but that is virtually the only noticeable blot in what is after all a live performance of a notoriously difficult score. As compensation, there are many superb instances of masterly music-making, such as when twenty minutes into the first movement we hear a chord sequence descending a full octave by stages before the reprise of the first subject. Then Ballot, like Marthé, succeeds in making the climax of the movement an overwhelming event. The Adagio is sublime; perhaps Inbal’s and Blomstedt’s more urgent pacing catches its lyrical quality and a restless forward momentum. By contrast, Ballot simply caresses one of the most beautiful tunes Bruckner ever wrote, giving the celestial melody space to breathe and using the silent pauses to great effect, hence its inordinately protracted duration: 23 minutes compared with the 17 and 19 minutes of Blomstedt and Inbal respectively. Again, the brass chorale is immensely grand and imposing, its tricky cross-rhythms expertly managed. The impact made by the Scherzo is slightly compromised by the generous acoustic; Ballot presents it as great, rolling juggernaut, stressing its geniality and its rhythmic and thematic kinship with the Scherzo of the Ninth. It is not the least charming or perky and there is a tendency for the sound to wallow. Here is no crisp, graceful terpsichorean tripping; we are given instead a muscular romp. The Finale is by turns exuberant and ethereal. Its serene, arpeggiated melody, underpinned by pizzicato lower strings seems to spiral heavenwards towards the dome of the basilica. Ballot is unafraid to risk over-emphasis of its naïve pathos by applying some daring rallentandos. Perhaps for some the sudden changes in direction and structural weakness of this movement result in its outstaying its welcome. On the other hand, the aureate blazing of the combined trumpets and trombones contribute to a climactic last five minutes of which Berlioz would have been proud. Inbal and Blomstedt make this movement dance but they do not generate the massive terror and dignity of the Last Trump which Ballot engineers here. I am increasingly of the view that Bruckner’s music can withstand a variety of interpretative stances. As previous conductors have demonstrated, this is not the only way to deliver this symphony but it constitutes an entirely satisfactory and convincing vision of a majestic work. There is however, one irksome sonic problem: a faint but perceptible whistle on G which persists throughout the whole recording - some interference apparently originating in the lighting in the basilica - and will prove irritating to listeners using headphones or equipment which emphasises the treble – or simply those of especially acute hearing. Commissioned by and published with the kind permission of The Bruckner Journal.